Hello! It’s another PUBWATCH column! I'm Mackenzie, and this is my first article—ever! For anything! 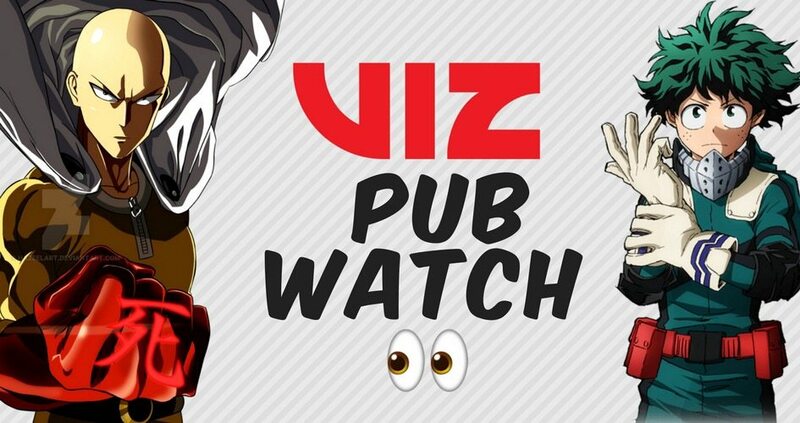 Every month you’ll be hearing from me about the latest VIZ Media, with some added commentary. This article is a hodgepodge of what came out from VIZ in October and the first half of November; there’s a lot to read! Hello! It’s another PUBWATCH column! I’m Mackenzie, and this is my first article—ever! For anything! Every month you’ll be hearing from me about the latest VIZ Media, with some added commentary. This article is a hodgepodge of what came out from VIZ in October and the first half of November; there’s a lot to read! To give myself a bit of credibility in your eyes, I’ve been reading manga and comics since I was seven, I learned Japanese as a kid because I loved Sailor Moon so much, and I . . . might . . . like manga more than you do. Before we get started, let me introduce VIZ. VIZ has been around since 1986, and started going by VIZ Media in 2005 when they merged with ShoPro Entertainment. If you’ve interacted with any kind of “mainstream” manga or anime, you’ve most likely come into contact with VIZ Media: it’s owned by two of the biggest names in manga publishing, Shueisha and Shogakukan. They’re the people who brought you titles like Sailor Moon, One Piece, Nana, and My Hero Academia, just to name a few. I’ll be talking about a few more below! Honey So Sweet is the third manga from Meguro Amu, and was serialized in Bessatsu Margaret from 2012 to 2015. VIZ Media released the final volume of Honey So Sweet this month under their Shojo Beat imprint. Long considered to be one of the most formidable up-and-coming shojo manga artists, Amu finds herself solidifying her style on this latest English release. To give a short summary: Onise is a scary looking guy rumored to be a delinquent. Nao is anxious and a bit of a coward, but kindhearted. Onise asks Nao out, with the intent of marriage, and we find out that Onise is actually the nicest, cutest person ever, complementing Nao’s own cuteness and kindness. They fall in love and help each other to be better people while helping their friends too. The title is perfect: this manga is so thick with sweetness it’ll make you blush. On the surface, Honey So Sweet is your typical shojo manga. It has a lot of internal character narration on top of pretty, sparkly backgrounds, a side couple, a sports festival, and the protagonists’ love being tested by others—classic shojo school life stuff. What’s unique about Honey So Sweet, though, was the lack of long-lasting drama in the series. It is honestly refreshing to read a shojo manga where communication is an important value to the characters. Most of shojo manga drama can come from a lack of communication between characters, so it was actually really heartwarming to see the encouragement of open communication in relationships and the acceptance of negative feelings. Both Nao and Onise are such genuinely nice people that they create a safe space for those close to them. There’s not much someone could do to earn the eternal scorn from the protagonists. This style of open communication is then enforced not only by friends, who often tell their corresponding protagonist to be more open with them, but by the protagonists’ respective guardians, which is the second point I’d like to mention. Neither protagonist comes from a nuclear family; Onise currently lives and takes care of his hardworking single mom, who we’re told divorced Onise’s dad and is living her best life being a career woman with an amazing and doting son. It makes the series even more wholesome. Full disclosure: I’m biased. I’m a sucker for the “rumored delinquents who are actually good and nice” trope. I love this series; it’s so cute. It honestly made me want to scream half the time, but in a good, out-of-secondhand-embarrassment kinda way. This series is cute, sweet, and honestly just a treat. I give it 8/10 Mackenzies. Read if you like: My Love Story! !, Say I Love You., wholesomeness, actually emotional male characters. 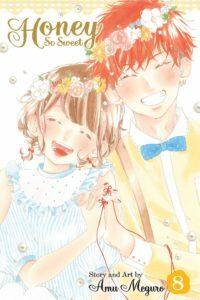 Sweet Blue Flowers is the latest English-language release for manga artist Takako Shimura, most well known for her manga Wandering Son, where both main characters are trans. Sticking with queer subject matter, Sweet Blue Flowers is a soft and sweet all-girls school love story revolving around two childhood friends, Fumi and Akira. Though they have been apart since they were kids, Fumi and Akira meet again when they both enter high school. Fumi’s school, Matsuoka, is the classic yuri hot queer girls high school—it almost reminds me of the girls’ school from Ouran High School Host Club. It’s the kind of school that girls who like girls fantasize about in middle and high school, or at least I did. Akira goes to the other famous girls’ school, “Fujigaya Women’s Academy,” a fancy Catholic school famous for basically everything. All the girls that go to Fujigaya are expected to be successful, beautiful ~ladies~. While Akira and Fumi are rekindling their friendship, Fumi meets the absolutely dreamy ~Yasuko-senpai~ and they soon start dating. Fumi comes out to Akira after, terrified her best friend will be disgusted (we’ve all been there amiright), but Akira, being a good person and friend, immediately accepts and shows her support for Fumi . . . which immediately starts Akira questioning her own sexuality. When serialized, Sweet Blue Flowers was published by Manga Erotics F, one of the few manga magazine publications that does not cater to any one group. At the series’ heart, it’s a story about supporting and accepting young queer girls. There’s something for everyone to identify with in this series. While there are only two protagonists, there are a lot of side characters and small side stories which intersect with the main story. This can make the plotline pretty convoluted. I was constantly having to go back and refresh myself on background characters to figure out who I was reading about. I’m excited to see the series continue, though. It seems like all of the small side stories will come into play eventually, tying the whole series together. I give it 7.5/10 Mackenzies. Read if you like: queer girls romance, good supporting characters, girls supporting girls supporting girls. Jackass! is a BL manga by Scarlet Beriko, a mainstay in the BL manga scene. It is also a certified trip. The plot revolves around the two protagonists, unlikely friends Keisuke and Masayuki. Keisuke has the most relatable and great older sister who’s kind of a hot mess, and they’re supporting each other so money is kind of tight. Masayuki is pretty and rich and has a pantyhose kink. The basis of this plotline is that his sister is lazy and took off her tights and sweatpants at the same time, and Keisuke grabbed them for gym and ran to school. So, when he changes for PE he steps halfway into a leg of the tights (which like, that is such an impressive feat, how does he do it???). Masayuki sees Keisuke in the tights and, to save him from embarrassment, takes him to the nurse’s office so he can get the tights off and the sweatpants on because that’s what bros do. They walk in on the nurse and Keisuke’s gay friend about to smooch, and the tension is high. The nurse and Keisuke’s friend scurry out, leaving Masayuki to fawn over Keisuke and his legs, easily convincing Keisuke to put the tights on all the way. It gets steamy and builds from that to Masayuki basically paying Keisuke to wear the tights. It shortly goes from no homo to a lot of homo, and long story short they end up dating and living together and doin’ their pantyhose thing in peace. I’m a big fan of Scarlet Beriko’s art; she excels at drawing pretty, lithe men and clothes. I wish Keisuke had a little more high-quality/defined leg muscles, but overall I’m not complaining. The side love story between the nurse and Keisuke’s friend I can take or leave; the age gap is . . . illegal, even if Beriko manages to make it seem slightly more romantic than creepy. The even less-important side relationship, which is really just a guy bullying Keisuke’s friend because he’s cute and gay, is cute because, surprise, the bully is also gay and struggling with internalized homophobia that he overcomes (woohoo!). Thankfully, outside of the nurse/student relationship there’s not really a question of consent in Jackass!, which can be rare in BL manga! I give it 7/10 Mackenzies. Read if you like: pantyhose kinks, BL that isn’t completely absent of morals, boys with loooooong legs.